Previously, I have posted Dr. Turner’s teaching videos on the eFAST exam (extended Focused Assessment with Sonography in Trauma) and the FATE exam (Focused Assessment of Thoracic Echocardiography). Today I’m posting her outstanding video on the RUSH protocol (Rapid Ultrasound In Shock) at the end of the notes. And after the video, there are more notes from Dr. Turner’s video. Be sure to watch all the way through as starting at 31:30, Dr. Turner presents three great case studies which brilliantly cover everything in the video–don’t miss it! The RUSH protocol is used in the evaluation of shock. This ultrasound exam can answer non-invasively the questions that in the past could only be answered with a pulmonary artery catheter. So the PA catheter can help us determine why the patient is in shock or what is the etiology (mechanism) of the shock. For the patient with respiratory failure the PA catheter can help us determine whether the etiology is cardiogenic or non-cardiogenic pulmonary edema. And we can use the PA catheter to follow the effect of our therapeutic intervensions (that is, what is the effect when we give fluids or pressors). However, the PA catheter is fraught with complications and technical pitfalls and is not much used at present. Physician performed bedside ultrasonography can answer all the questions that the pulmonary artery catheter can answer. And ultrasound can do it more rapidly, and without any of the risks of a pulmonary artery catheter. The above is simply another way of looking at the pump, the tank, and the pipes. Now let’s watch Dr. Turner’s outstanding teaching video. 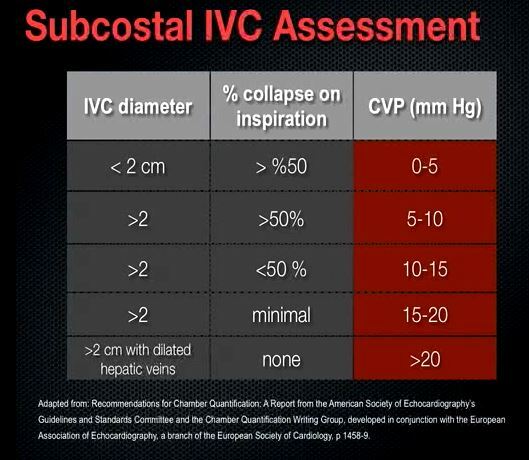 At about 12:30 in the video Dr. Turner identifies a crticical question that we want to answer in our shocky patients: “Will they be volume responsive?” And what we are asking is: Is our patient on the steep part of the Frank Starling Curve where a fluid challenge will increase cardiac output. And the answer can be yes, even in patients with poor systolic function. So how do we decide? But the above has not been shown to be predictive of volume responsiveness. Instead, we now focus on dynamic parameters. Approx 13:20: Increased intrathoracic pressure will decrease venous return (in a spontaneously breathing patient, this will be during exhalation and in a ventilated patient–it will occur during inhalation. Decreased intrathoracic pressure will increase venous return. The Frank-Starling law predicts that for a change in preload, you will change your stroke volume or cardiac output. From 16:20 to 17:50, Dr. Turner discusses Delta Vmax and Delta VTI. These are rather advanced concepts in doppler measurement and making these measurements is technically demanding. This discussion simply introduces the terms. If the IDI is greater than 12% then the patient will respond to volume. And using the M-mode cursor is a great way to get the numbers. “Passive Leg Raise” is discussed by Dr. Turner from 19:05 to 20:20. This is a means of giving a reversible fluid bolus to see if it increases cardiac output. We assess for a leaky tank with the views of the Focused Assessed Sonography in Trauma (FAST) exam. Dr. Turner very briefly reviews this exam from 20:20 to 22:10. Dr. Turner clearly and completely explains and demonstrates the FAST exam in her YouTube Video, eFAST: extended Focused Assessment with Sonography in Trauma. 22:10 to 24:30: We also need to look at the pipes (arteries and veins) because they can be the cause of shock. In the final part of this video beginning at 31:30, Dr. Turner goes over three excellent teaching cases. This entry was posted in Advanced Cardiac Life Support, Emergency Medicine, Medical Imaging, Pediatric Advanced Life Support, Pediatrics, Ultrasound Imaging. Bookmark the permalink.